Italy's smallest and most mountainous region boasts the Alps' best known peaks – Mont Blanc (the continent's highest cable car ride), Matterhorn, Monte Rosa and Gran Paradiso. The town of Aosta, founded by the Romans in 25 BC, in honour of Emperor Augustus' victory over the Salassi, was a real gateway to the Alps; its layout can still be identified in its main monuments such as the Praetorian Gate, the Roman Theater, the Cryptoporticus which was part of the Forum complex in a semi-subterranean gallery. Aosta is worth a visit that should last 2 good hours: the Roman sites as well as the Cathedral and the Saint Orso Church and Cloister will surprise you with their beauty. You’ll do a journey back in time if you follow me in the western town’s outskirts for discovering the archeological park of Saint Martin de Corléans that bears witness from the end of the Neolithic Age to Medieval periods: dolmens, steles, plough furrows human remains are shown in a powerful exhibition. I highly recommend a full day tour for exploring the Valley’s Castles: the Gothic Renaissance style Castle of Issogne, the marvellous medieval Fenis Castle, the Verrès Castle, 14th-century military manor or Castel Savoia, an elegant mansion owned by the Italian Royal family. 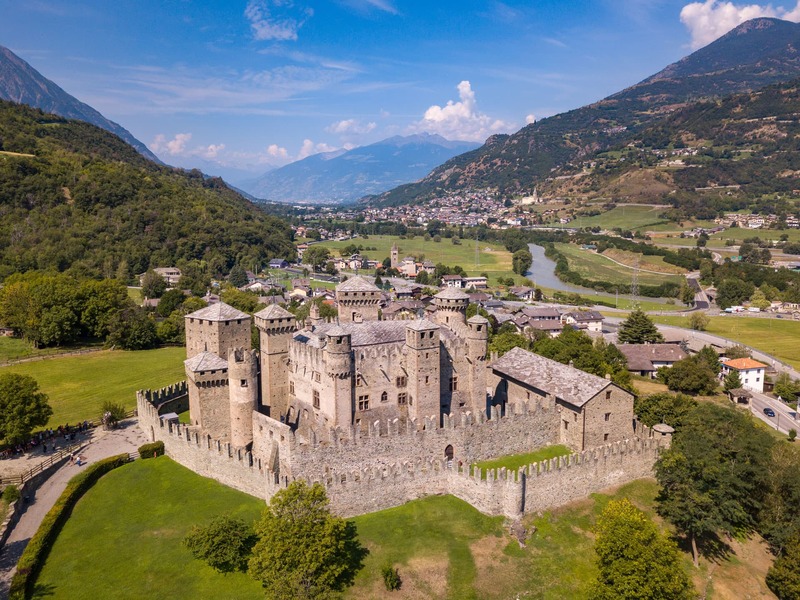 We cannot forget to take a look at the imposing features of the Bard Fort visible from the highway connecting Aosta Valley to Turin.